This week at dmexco, the international leading digital marketing conference, Isobar has launched ‘Voice Assistant’, the latest Amazon Alexa innovation prototype by Isobar’s international innovation accelerator - Isobar Nowlab. The Voice Assistant integrates a smart mirror, Salesforce Commerce Cloud and an Alexa skill to enable guests to experience a series of branded voice interactions. With the ambition to narrow the gap between brand inspiration and commercial interaction, Alexa will promote discovery, aid recommendation and assist with ordering. Built by Isobar's Global team, eCommera Linked by Isobar, and Isobar US, the innovation is part of a ‘test and learn’ initiative to help brands discover the potential of voice technology in enhancing the human experience. 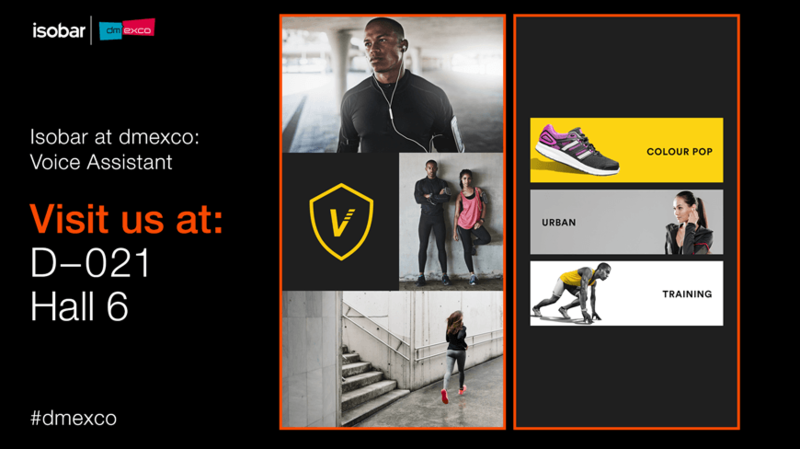 For two days at the conference, guests to the Dentsu Aegis Network booth (Hall 6 D-021, close to Spotify) will be invited to “shop” or “discover” ‘V’ - an exclusive new sportswear brand collection using solely an Alexa skill. The test will explore how narrative and contextual triggers influence product choice and selection, and where levels of AI varies across the range of scenarios. The innovation follows hot on the heels of The Power of Voice, a voice enabled bar experience delivered by Isobar, iProspect and Diageo at Cannes Lions 2017. The learnings from both test and learn initiatives will be fed back into Isobar, Nowlab and the agency clients to help develop and improve further voice innovations. Alex Hamilton, Head of Insight eCommera Linked By Isobar, said, “We’re moving from a world where customers engage with brands through smartphones and touch screens, to one where users will be able to satisfy their needs by talking to their devices, by interacting through gesture or even by just looking at them. “The emergence of voice-powered devices, spearheaded by Amazon Alexa, inspired us to think of how brands can leverage the power of speech to build closer relationships with customers.